I chose to do a comic book about Othello Act 2, scene 3. 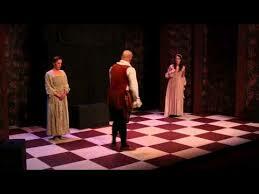 In this scene are Othello, Desdemona, Cassio, Montano, Roderigo, and Iago. Iago got Cassio drunk, and Cassio started to get mad because he was drunk, and then there was a fight. I had a good understanding of the play, but honestly, it was hard doing the comic book because of the computer difficulties. I was challenged to make the characters fit, finding good characters that fit the scenes, and showing that they had real emotions as well. What I learned about myself was that if I had the chance to do an online or hand-illustrated comic, I would still choose to do the online version because once you get the hang of it, it gets easier. Working the keyboard functions soon became more automatic. Click here to read my comic. Othello Comic Book by Justin is licensed under a Creative Commons Attribution-ShareAlike 4.0 International License.